Very excited to be launching PracticePoint!! Excited to be starting our pilot studies with the PABI (Penguin for Autism Behavioral Interventions) robot this summer! The robot will be assisting in Applied Behavior Analysis (ABA) therapy for children with Autism at a local school. Check out AIM Lab PhD students in Robotics Engineering being interviewed by Robot Magazine!! Congratulations to Weijian Shang for defending his dissertation "Teleoperation of MRI-Compatible Robots with Hybrid Actuation and Haptic Feedback"!!! Press Release for our first in man trials for robotic MRI-guided prostate cancer biopsy. Listen to the audio clip from WBZ radio on September 16, 2014. Ritesh Adhikari, Mike Cross, Tim Forrest, Hosung Im, Jason Klein, Anselm Mak, and Julieth Ochoa presented their project on: Exomuscular Sleeve for Upper Limb Stroke Rehabilitation. Chris Dunkers, Brian Hetherman, Paul Monahan, and Samuel Naseef presented their project on: Indoor Navigation and Manipulation using a Segway RMP Platform. 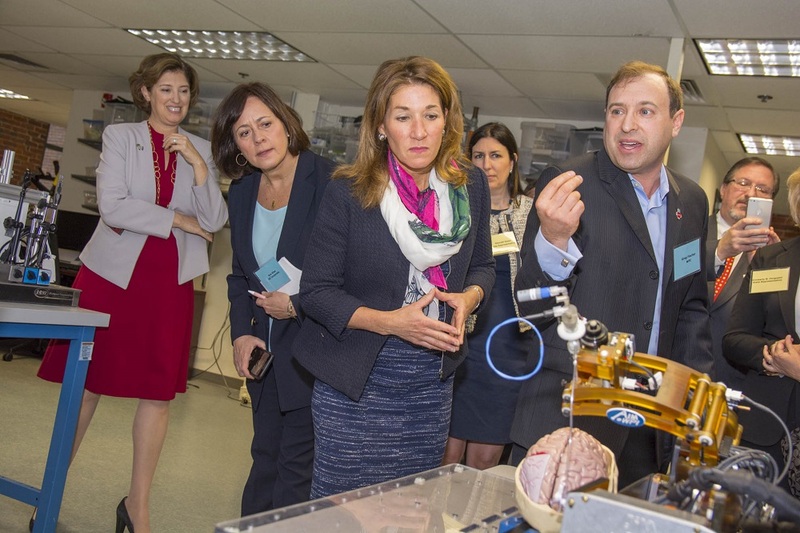 The AIM got to show off its work on Wearable Soft Robotic Rehabilitation Robots and also our MRI-Compatible Prostate Cancer Robot at the MassTLC Future of Robotics Summit. Happy to announce that we were awarded an NIH Research Grant through the Academic-Industrial Partnerships for Translation of in vivo Imaging Systems for Cancer Investigations program to support "MR-Guided Precision Conformal Ablation Therapy for Brain Tumors"
Congratulations to all those from the AIM Lab graduating!!! We had our first two PhD students from the AIM Lab Greg Cole and Hao Su! We also want to congratulate our Master's graduates: Hanlin Hong, Wenzhi Ji, Annette Rivera, Yunzhao Ma, and Satya Janga! Congratulations to Hao Su for defending his dissertation "Force Sensing and Teleoperation of Continuum Robot for MRI-Guided Surgery"
Congratulations to Greg Cole for defending his dissertation "Modular MRI Guided Device Development System: Evolution, Validation And Applications," the first PhD student in WPI Robotics Engineering and the AIM Lab! Congratulations to Hao Su for winning the 2012-2013 Advanced Simulation and Training Fellowship from the Link Fondation! The award will support his work on "Haptic Training and Interventional System for MRI-guided Percutaneous Needle Placement." The Simons Foundation Autism Research Initiative SFARI featured the article "Robot Renaissance" about socialy assistive robots (SARs) for working with chodren with Autism disorder. Our robot PABI, a.k.a Penguin for Autism Behavioral Interventions, was featured. Hao Su and Weijian Shang presented their work at SPIE Medical Imaging in San Diego, CA. Prof. Fischer's RBE 3001 (Unified Robotics III) course is featured in the New York Times as part of the article Why Science Majors Change Their Minds (It's Just So Darn Hard). The AIM Lab supported Bancroft High School's Senior Co-Op program. Tommy Pham, Alex Lucena and Connor Richmond work with Greg Cole on the Neuro Robot. See their video here: Youtube video of co-op. Hamresh Lutchmun presented his project on: Stent Design for Percutaneous Valve. Nick Alunni, Eric Jones, Ricky Goloski and Andrew Haggerty presented their project on: Hierarchical Swarm Robots. Elizabeth Alexander presented her project on: Affordable Compact Humanoid Robot for Autism Spectrum Disorder in Children. Dan Jones and Andy Lewis presented their project on: StandAlone Surgical Haptic Arm (SASHA) for Telesurgery. Design World featured the article "Plastic Bearings and Linear Guides Put the Moves on MRI-guided Robot" about the MRI prostate robot designed by Prof. Gregory Fischer and Hao Su in their medical e-newsletter. Hao Su recieves International Conference on Robotics and Automation (ICRA) NSF Travel Fellowships award. Congratulations Hao! Prof. Gregory Fischer and Hao Su attended the 18th Medicine Meets Virtual Reality (MMVR 2011) in Newport beach, California. They presented High-Field MRI-Compatible Needle Placement Robot for Prostate Intervention. Greg Cole and Kevin Harrington attended the 12th International Symposium on Experimental Robotics (ISER 2010) in Delhi, India. 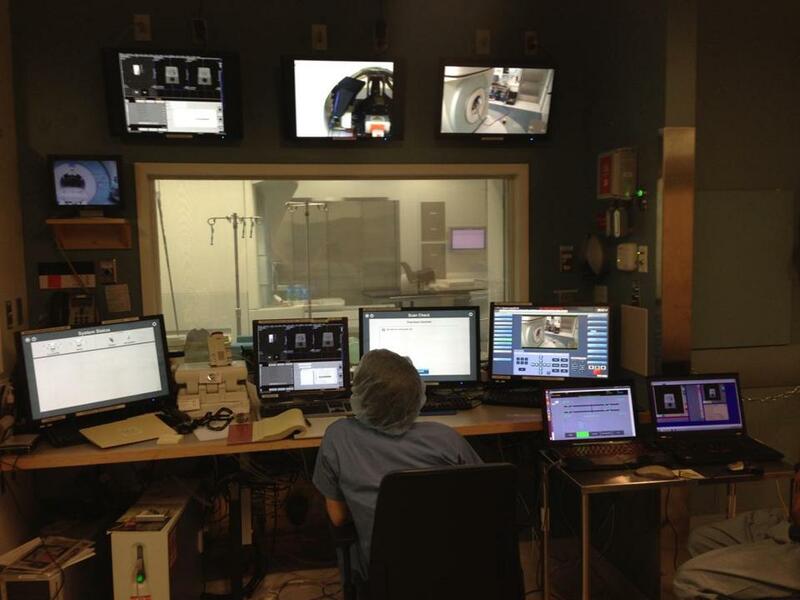 They presented Closed-Loop Actuated Surgical System Utilizing Real-Time In-Situ MRI Guidance. Surgical Products Magazine posted an article and video Guiding Surgical Robots With MRI Images promoting the work in the WPI AIM Lab. Video also available here: http://www.youtube.com/user/WPI#p/c/E597F22DB929D8FD. Prof. Fischer and collaborator Dr. Nguyen (Children's Hospital) are featured in an article on Robotic Surgery in BioPhotonics Magazine: A Cut Above: Robotics in Surgery. Prof. Fischer and colleague Robert Webster (Vanderbilt) organized a workshop on Enabling Technologies for Image-Guided Robotic Interventional Procedures at 2010 Robotics: Science and Systems Conference VI RSS 2010 in Zaragoza, Spain. 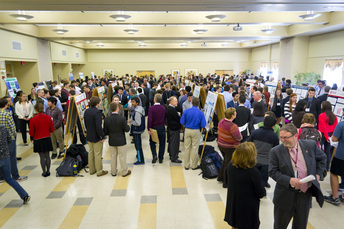 Greg Cole was awarded 1st place at the WPI Graduate Research Achievement Day (GRAD) 2010. Michael DiBlasi, Andrew Nehring, Andrew Smith presented their project on Pneumatic Actuator Development for MRI Robots. The project was a finalist in the Mechanical Engineering Project Presentation Day. Greg Cole was awarded 1st place at the 2010 Innovation Presentation Competition for his work titled "MRI Compatible Surgical Systems: Analysis of Compatibility Methodologies and System Effectiveness". Prof. Fischer was a conference organizer and session chair. Thanks to Weijian Shang for volunteering to help with the conference. Hao Su presented his work titled "Haptic System Design for MRI-Guided Needle Based Prostate Brachytherapy" at Haptics Symposium 2010, Waltham, MA. Prof. Fischer, Yi Wang, Hao Su, and Greg Cole represented the AIM Lab and WPI at the 2009 IEEE Engineering in Medicine and Biology Conference (EMBC 2009) in Minniapolis, Minnesota. Yi Wang presented the paper titled "MRI Compatibility Evaluation of a Piezoelectric Actuator System for a Neural Interventional Robot" by Yi Wang, Greg Cole, Hao Su, Dr. Gregory Fischer, and Dr. Julie Pilitsis. The lab welcomes Master's student Kevin Harrington. Prof. Fischer and Greg Cole represented the AIM Lab and WPI at the 2009 IEEE International Conference on Robotics and Automation (ICRA 2009) in Kobe, Japan. Greg Cole presented the paper titled "Design of a Robotic System for MRI-Guided Deep Brain Stimulation Electrode Placement" This presentation was also given at Tokyo University on May 12, and AIST on May 22. The MRI-Compatible prostate robot is featured in Medical Design Magazine. Greg Cole has been awarded the 2nd place award in Engineering at the Annual WPI GRAD Research Day for his poster titled "Design of a Robotic System for MRI-Guided Deep Brain Stimulation Electrode Placement." Read more about the MRI Neurosurgery Robot for DBS. The lab welcomes Doctoral student Hao Su. Wang Yi attends the Medical Robotics and Computer-Integrated Interventional Systems (MRCIIS) winter school at Johns Hopkins. 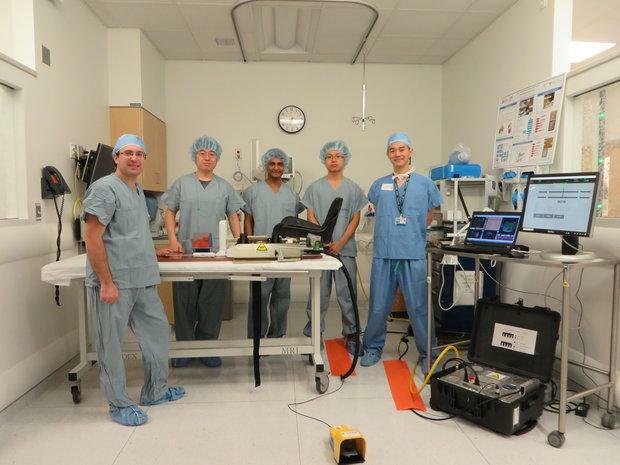 Successful joint experiment at Brigham and Women's Hospital with our MRI Robot. The lab welcomes Doctoral student Wang Yi.